ALL ON LINE OR FACE TO FACE TRANSACTIONS REQUIRE PROOF OF AGE CERTIFICATION TO COMPLY WITH CURRENT GOOD PRACTICE AS WELL AS THE LAW. YOU MUST BE A MINIMUM OF 18 YEARS OLD. If you cannot provide suitable proof then PLEASE DO NOT WASTE ANYONE’S TIME. 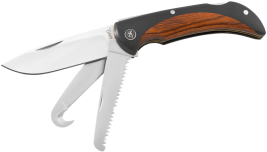 REMINGTON ‘SPORTSMAN SERIES’ LARGE FIXED BLADE KNIFE. The Remington F.A.S.T. ‘Fast Action Soft Touch’ Large Fixed Blade Knife comes with a 440 Grade, Bead Blasted, 5 3/8” (137MM) Stainless Steel, Clip Serrated Blade set with a Rubber Coated Matte Black handle / grips. 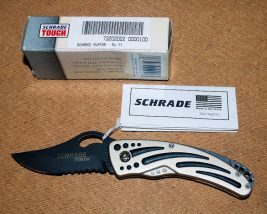 The knife comes complete with its own Cordura sheath to fit it to your belt or similar webbing strap. A good sized and comfortable grip ensures a knife that will take some use. Lanyard hole to the base too. Should make a good field knife for general purpose use as well as hunting etc. OVERALL LENGTH 10 ½” (270mm).